Ever wonder about the amount of work that goes into a cemetery headstone? Maybe not — but the process is actually quite interesting and involves a number of interesting jobs. How do I know? My dad, Don Rath, designs and sells these headstones. For years, it was normal for my family to have large chunks of granite sitting in front of our house. However, when it came time to explain what my dad did for a living, I had no idea where to start. Not until I started looking for my own career did I actually dig in and uncover the process behind putting a headstone in a cemetery. The process starts in a quarry and ends in the cemetery, but in between are two crucial steps that make each monument unique: the design and cutting of the stone. Some people, like Bob Trottier of Buttura and Gherardi Granite Artisans, do both the design and the cutting, which includes sandblasting and stone etching. Others, like my dad, who are more involved in the retail side of the industry, create designs and then outsource the cutting and engraving to companies like Buttura and Gherardi. How Do You Get Into This Industry? “Unfortunately,” Trottier said, “sandblasting is a dying art. Excuse the pun.” New technology is replacing much of the manpower in the industry, and computer skills are a must. The monument industry has begun using high-tech software that cuts the stone with a click of the mouse. A lot of training can be done on the job since there are no degree programs for monument cutters, but basic knowledge of CAD (Computer Aided Design) and Photoshop is key. The design was made on a computer and cut with sandblasting machinery. What’s the Daily Grind Like? Everyday tasks for Trottier involve lots of computer time. He designs 2D and 3D stonework in CAD, then uses a program called Computer Numerical Control (CNC) to transform those CAD drawings into numbers, essentially like plots on a graph. The cutting machine uses those numbers to determine where to cut the 3-dimensional object. He also uses PhotoShop to modify and touch up images that families want included on a stone. When he’s not on the computer, Trottier is busy with hand and laser etching, essentially drawing into stone. For example, the drawings on the monument below is all etching. It’s not as deep as engraving, and can include dimension, shading, and perspective like any artwork done on paper. He also adds images to headstones using porcelain photos; the photo is put onto the porcelain and baked in an oven so it lasts a lifetime. Meanwhile, Rath’s daily tasks range from sales and design, to installations and monument maintenance. As the co-owner of John H. McGee & Son Inc., a retail monument company, for over thirty years, he also deals with basic administrative tasks and marketing responsibilities. This field isn’t just limited to grave markers. Monuments everywhere are designed and cut by the same people who put headstones in cemeteries. Think about the tributes to veterans in public parks and squares, and granite work in buildings across the country. Rath managed the sandblasting for the entryway to the New York Wine and Culinary Center in the Finger Lakes region of the state. 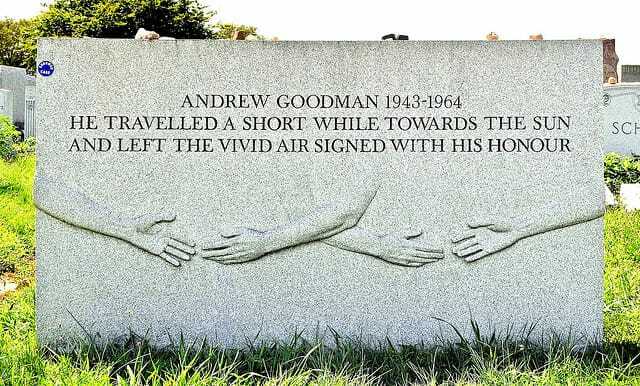 He has created thousands of monuments scattered across cemeteries and parks in the Western New York. His favorite project, though, was helping to design and build a family’s replica of the facade of a temple in Europe. Trottier did the sandblast carving on the restored portions of the fountain in front of the Plaza Hotel in New York City, at the entrance to Central Park and across the street from FAO Schwarz toy store. He also did much of the design work for the memorial monument for famed guitarist Les Paul, in Waukesha, WI. Like any job, being a monument designer and cutter involves a certain amount of stress. “I worry about the possibility of destroying an expensive piece of granite,” says Trottier. Granite is quarried and shipped in large chunks to his company — it’s like buying in bulk, and then selling the smaller pieces. If you make a mistake on the design or in making any of the cuts, that piece of granite goes to waste, and so does a lot of time and money. Inside the warehouse at Buttura & Gherardi, granite artists etch designs on monuments. The job is also physically demanding. Installations and monument maintenance take a toll on your body. While I’ve seen monuments put into place using huge cranes and handcarts, I’ve also seen my dad carry a marker across the cemetery with his own two hands. Granite weighs 18 pounds per square foot, so that’s not a light load. In the end, it’s the final product that makes the job worth it. “I love being able to start with a family who is having a difficult time and create a lasting tribute for them,” says Rath. Your Turn: Would you put your design and computer skills to work as a monument designer or cutter? Erica Rath (@ericajrath) is a freelance journalist and blogger who enjoys black coffee, her dog Juneau, and road trips. She blogs about her adventures, job hunt, and inspirations at Entirely-Erica.com. Photos in post courtesy of Don Rath and Bob Trottier.